1340 Mission Statement Since its founding, 1340 Magazine has been a platform for artists youâ&#x20AC;&#x2122;ve heard of and artists you should get to know. Through our print editions and online presence we are building a community of artists and connoisseurs from all over the world, and showcasing a diverse collection of styles, influences, and processes. Published by 1340 Media (Part of Thedge BV) All rights reserved 1340 Media, the artists, the writers and photographers. 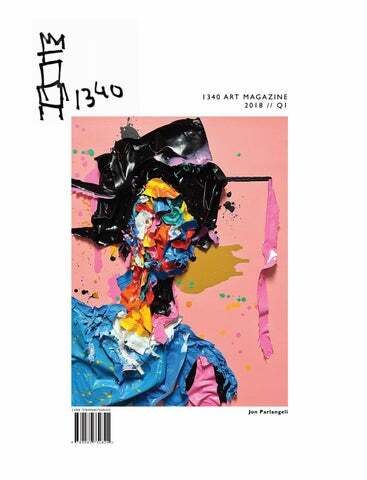 EDITOR’S NOTE Welcome to the Q1 Edition of the 1340Art Magazine. We kick 2018 off with a bang through a rethinking and redesign of 1340Art. Not only does this edition display an even greater variety of artwork, but as a part of our global art movement, we have recently launched 1340Gallery – our premiere online gallery! With thousands of noteworthy pieces of art exhibited online, from paintings and photography, to sculptures and drawings, we are brimming with excitement for this latest feature. By adding this to our already significant range of art platforms, we have substantially increased and diversified our avenues used to promote emerging artists from around the globe, as well as their remarkable artwork. For the Q1 1340Art Magazine, we have hand-picked a collection of intriguing pieces to present, and we discover the allure of the unique gallery space that is The Crypt Gallery in London. Once again, our readers can expect a dynamic showcase of distinguished art by wonderfully talented artists, all beautifully presented in a cutting-edge, international, fine art magazine. We’re certain art enthusiasts and professionals alike will find something to appreciate amongst the visual bounty that fill these pages. Thank you to the artists who participated, as well as those of you reading this edition, for joining us in our passion for great art! M A R TA D E L A PA R R A P R I E T O Marta de la Parra Prieto is a Madrid born and raised visual artist, aesthete, and designer. Art has been her life long passion, and it led her to study drawing in Florence, design in Milan and Madrid, and filmmaking in New York, among other courses, workshops, and specialized literature. â&#x20AC;&#x153;My work revolves around aesthetic. Beauty is not a shallow and banal matter. Beauty and aesthetic constructions are intrinsic to what defines us as human beings.â&#x20AC;? Growing up in the Snowy Mountains of New South Wales (AUS), Brock has always been fascinated by birds in flight. The way they fold themselves, twist and contort their colourful bodies to float effortlessly through the trees. A blur in time, caught in another realm, between the past and the present. Memories are similarly experienced. Fragments that come and go from our present, appearing, then lost again. They seem to twist and change and reform in our minds, barely tangible, constantly evolving with the addition of time and experience. â&#x20AC;&#x153;I am looking to create a visual poem through my work. Attempting to will the birds out of mid air, to grapple with them mid-flight.â&#x20AC;? â&#x20AC;&#x153; Through my pieces, I talk about meandering cities and tortuous architectures, about heritage and ancestral stories, entropy and chaos, life and death in this and other planets.â&#x20AC;? SUBSCRIBE Make sure to subscribe and be the first to recieve next quarterâ&#x20AC;&#x2122;s issue of 1340 Art Magazine. Get acquainted with the artists you already love, and those youâ&#x20AC;&#x2122;ve been waiting for..
http://estearte.com/en/ The fair’s unique format; the excellent exhibitors program; the outstanding agenda of public debates, artist talks, live performances and guided tours; are what makes Punta del este, Punta del Este. http://www.laartshow.com/ The LA Art Show is distinguished as the region’s foremost celebration of the visual arts offering collectors, galleries and the community the opportunity to view, exhibit and purchase art from around the globe. https://www.londonartfair.co.uk/ Over the last thirty years, London Art Fair has given access to exceptional modern and contemporary art, as well as expert insight into the changing market. 20th Century to today. 17−21 January 2018 http://www.firstartfair.nl/en/ The FIrst Art Fair is a sparkling New Year’s Fair for contemporary art, with a broad spectrum of high-level art. At the fair you will find painting and sculpture, glass, photography and jewelry from hundreds of renowned and young artists. 15-19 February 2018 https://en.parisinfo. com/paris-showexhibition/136049/artcapital For 5 days, you can discover the work of 2,000 artists (painters, sculptors, photographers, architects, engravers and so on…) at this great art fair. Open to the general public since 2006, the fair brings together artists from all different backgrounds. 21-25 March 2018 https://affordableartfair. com/fairs/new-york Affordable Art Fair NYC showcasea original contemporary work from over 400 contemporary artists. Visitors can browse the diverse and carefully curated selection of artworks and discover the artworks that make them Art Happy! LIFE GOES ON WITHIN YOU AND WITHOUT YOU Drawing on the Buddhist concept of impermanence, this fifth collection of portraits by Sri Lankan born Hong Kong artist Kos Cos, explores the contradiction between individuality and mortality created by the passage of time. The traditional view of the relationship between portraiture and time, is that portraits endure while their subjects grow older and ultimately die. The distinction of ‘Life Goes On Within You And Without You’ is that the artist has introduced an element of time into the portraits themselves. The flow of thick vivid paint that runs through each portrait is a metaphor for time. It’s a technique that takes several weeks to complete. Vibrant colours are poured onto the canvas and left until a dry outer layer form, onto which an entire portrait is painted. When the crust is broken, the dynamic inner layers of still liquified paint are released to make their own irreversible impression in a deliberate act reminiscent of the destruction of sand mandalas by Tibetan monks. r e v o c s i d Discover and buy affordable fine art from the comfort of your home. 1340Gallery is a premier online gallery where you will discover an exclusive selection of carefully curated art by top upcoming talent from all over the globe. Works can be bought directly from the website and delivered anywhere in the world. always bluish and blurred. The beings are now gone, and some faces solely remain. The story they lived is not ours to tell. They are now shadows. A proper way to talk of and with them is to take their ghostly remains and to put them into a new light. The fact is, ghosts do exist. We see them every time we look at a picture. We talk about them, but they remain anonymous. What if we take a picture of their traces, the very traces they imprinted once in time? It’s not a photograph of a photograph, it’s not a shade, even less a foggy impression. It’s a question. The query of our passage through the centuries. Photographing a photograph is not a simple way to ask, it’s a necessary abyss setting of the footprints we will leave behind. A Polaroid photograph of a photograph is the intimate condition of the passage of time. Using such a way, we let the ghosts be what they want to be, shout what they dare, cry what they may. L A R I S A A N T S E E VA Since childhood, Larisa has been fascinated by color; the combinations, the way they mix, and their complexities. Larisa believes that color is the most powerful form of transmission of her feelings and state of mind. â&#x20AC;&#x153;My art is my emotions, my mood, and my life. My works reflect the essence of nature.They are alive, their lines and spots are expressive. I want to look at them and watch this story.â&#x20AC;? unique space- completely untouched and retaining many of its original features, as well as remaining the home of over 560 bodies buried in its tombs. With its chambers and interlinking corridors, stepping into the gallery is like stepping into an underground world. With vaulted ceilings and a labyrinth of passageways, the Crypt Gallery provides an intensely atmospheric backdrop to promote the work of a wide variety of artists, all kept under the watchful eye of its statue caryatids. The gallery’s remit is very inclusive, with no set house style - showing everything from degree shows to professional artists. The space is available to hire and they retain its affordability to maintain the gallery’s accessibility. This makes for a wide range of art work and a very interesting program of shows and events with everything from installation and fine art to performance and launches. â&#x20AC;&#x153;The distortion offers an endless world of discovery rather than a static, basic vision of a given moment in time. Deconstructed or reconstructed, the image beckons us into a new dimension. It is a sublime gift of the mind as opposed to matter, it is also a disruption towards an illogical environment where we discover to what extent reality moves aside, without any resistance, when confronted by the power of abstraction.â&#x20AC;? JOIN US Are you an artist who wants to be featured in our next issue or on our social media? Apply on our website, and who knows, maybe weâ&#x20AC;&#x2122;ll see you next time. To sell your work, you can also check out our curated platform at 1340gallery.com.